This is an introductory user guide for students, educators, and anyone else who would like to learn to use Google Earth for education or fun. It includes instructions and diagrams on how to perform common tasks associated with viewing or creating map data. It also provides links to other sites that offer additional information. Google Earth is a geobrowser that offers satellite and aerial imagery, ocean bathymetry, and other geographic data over the internet to represent the Earth as a three-dimensional globe. Geobrowsers are also known as virtual globes or Earth browsers. Google Earth provides search capabilities and the ability to pan, zoom, rotate, and tilt the view of the Earth. It also offers tools for creating new data and a growing set of layers of data, such as volcanoes and terrain, that can be displayed in the 3D Viewer. Google Earth is available on the web for free as well for purchase in more advanced versions at the Google Earth web site. Below are presented techniques for performing essential Google Earth functions. Each section concludes with a link to the content in the official online Google Earth User Guide that offers additional details about that function. For comprehensive information about those and other functions, see the Google Earth User Guide. For a one-page summary of some of these essential functions, see the Google Earth Tip Sheet (Acrobat (PDF) 440kB Nov20 08). When you launch Google Earth, the Earth appears in the 3D viewer within the Google Earth user interface, which also includes a set of panes, a menu, a toolbar, navigation controls, and a status bar. The 3D viewer shows you aerial and satellite imagery and information about places represented on the map as points, segmented lines, polygons, image overlays, photographs, and 3D models. When the terrain layer is activated, the landscape appears in three-dimensional relief. 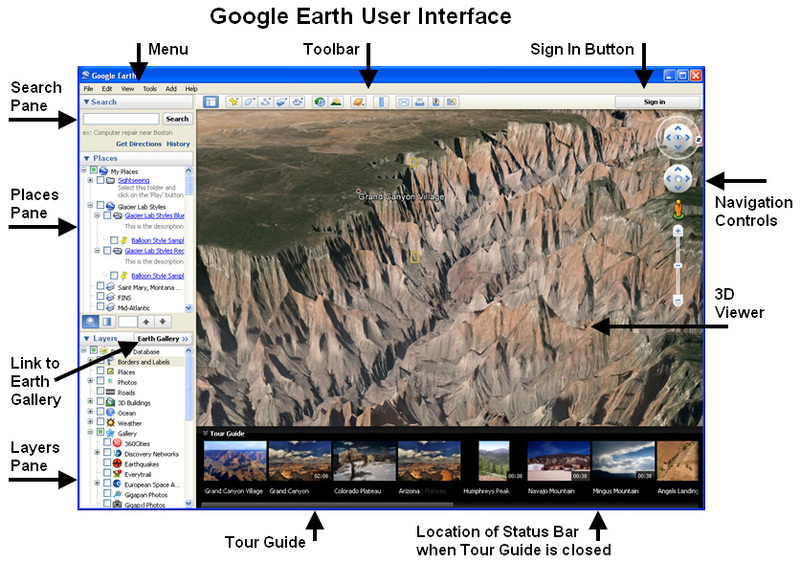 The Google Earth toolbar contains tools that perform tasks related to the configuration of the user interface, the creation of objects to place on the map in the 3D Viewer, recording a tour, showing historical imagery, showing sunlight in the 3D Viewer, a ruler for measuring lengths of lines and paths, emailing a representation of the 3D Viewer, saving or printing an image of the contents of the 3D Viewer, and viewing the data in Google Maps. The Google Earth Toolbar offers tooltips that pop up to identify each tool as the mouse passes over it. For example, the Hide/Show Sidebar button toggles the visibility of the three panes on the left side of the user interface on and off. The Add Placemark, Add Polygon, Add Path, and Add Image Overlay buttons are for creating new data. The functions of some of these tools are described below. In addition, the Google Earth User Guide identifies the components of the user interface, and offers comprehensive information on how to use them. Navigation is the process of changing the position of your view of the Earth. The position of the view can be changed through the navigation controls, mouse navigation, key combinations, searching, or visiting pre-defined places. The navigation controls are used to adjust the location of the view, the map orientation, the zoom level, and the tilt. Drag the ring with the "N" on it to rotate the view. Click the "N" to orient the globe so that north is at the top. Keyboard and mouse controls for navigation and other Google Earth techniques differ, in some cases, between Windows machines and the Macintosh. For a list of these controls, see Google's Keyboard and Mouse Controls page. Dragging the mouse while the left or right button is held down can also be used to navigate. To use the mouse to pan the 3D Viewer, hold down the left mouse button and drag the view in the direction that you would like to move it. 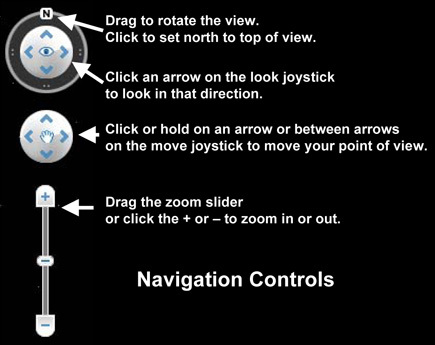 With the right mouse button held down, you can rotate the 3D Viewer clockwise by dragging the mouse to the left, and you can rotate it counterclockwise by dragging the mouse to the right. The mouse wheel can be used to navigate as well. To zoom in with the mouse, turn the mouse wheel away from you. To zoom out with the mouse, turn the mouse wheel down toward you. With the right mouse button held down, you can also zoom in by moving the mouse down, and zoom out by moving it up. For additional information, see Google Earth User Guide: Navigating in Google Earth. The Google Earth Status Bar shows the imagery date, latitude, longitude, elevation, and eye altitude of the current view. It is visible at the bottom of the Google Earth User Interface when the Tour Guide is closed. As the Search pane is pictured here, we have flown to Yosemite National Park, after clicking the Search button. Addresses can be specified in a variety of formats. For example, you can fly to 37.42197, -122.08414. In addition to natural features, you can search for cities, towns, countries, types of businesses, or other types of establishments such as schools, airports, churches, temples, mosques, hospitals, or police stations. The Get Directions button will get you driving directions between two places that you specify. The resulting directions can be saved or played as a tour. For additional details, see Google Earth User Guide: Finding Places and Directions. The Places pane is where third-party data and your own data are listed and organized. Data that has been loaded or created during the current session generally resides in the Temporary Places folder. Documents, folders, and placemarks can be dragged to reorganize them in the Places pane. create placemarks to identify particular points on the map, and possibly include descriptive information, images, and hyperlinks that appear in an information balloon when the placemark is clicked. For example, a series on rock outcrops can be identified by placemarks, with descriptions and closeup photographs placed in the information balloons. draw paths to identify routes or other linear features. This might be useful for a virtual guided tour along a trail. draw polygons to identify or outline areas or features of interest. Polygons might be used to enclose areas of similar soil type or vegetation. overlay maps or specialized aerial imagery on the Google Earth imagery. For example, a USGS topographic map overlay may help interpret a glacial landscape or a series of waterfalls. Data that you download or create can be saved within the My Places folder so that it is available in subsequent sessions. You can either drag it into that folder or click Yes, when asked whether to save the items that are in the Temporary Places folder in the My Places folder when you exit Google Earth. However, it is a good practice to explicitly save your data. To save an item that is listed in the Places Pane, right-click it (ctrl-click on the Mac) and choose Save Place As from the contextual menu that appears. In order to make informed decisions about how to save your data, you need to know something about the format of Google Earth data. Google Earth data, including placemarks, paths, polygons, and overlays, consists of KML (Keyhole Markup Language) markup that can be saved in text format with a kml file extension, or, most commonly, in compressed KMZ format with a kmz file extension. A kmz file is actually a zip archive which contains a doc.kml file with KML code, and possibly other supporting files such as images. The KMZ markup for a place or a container can be viewed by right-clicking it (ctrl-click on the Mac), choosing Copy, and pasting it into a text editor. 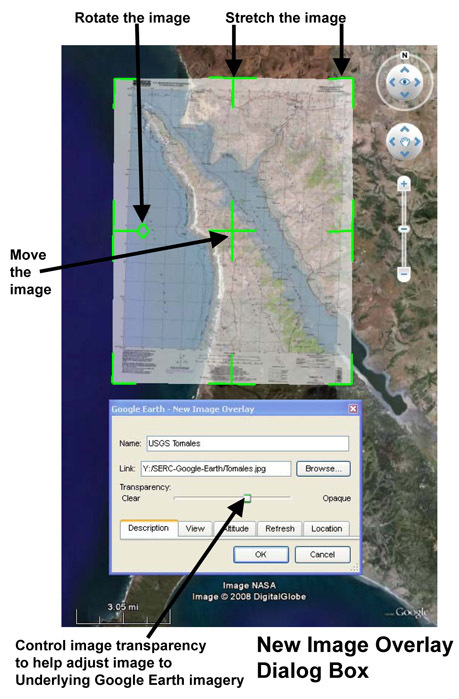 Google Earth can open or import a variety of data files, including the standard KMZ and KML formats, as well as images (jpg, bmp, tif, tga, png, jpeg, gif, tiff, ppm, and pgm), gps (gpx and loc), and Collada models (dae). Google Earth Pro can open additional formats, including ESRI shapefiles (shp) and MapInfo (tab) files. Once opened in Google Earth Pro, most of these formats can be saved as kmz files, which then makes them available to be used in the free version of Google Earth. To create a new placemark, first navigate to the location in the 3D Viewer where you would like to put the new placemark. Then you can create it by clicking the Add Placemark button on the toolbar or right-clicking the container listed in the Places Pane in which you would like to put the new placemark, and choosing Add, and then Placemark. There are other means of initiating this process as well. In either case, the New Placemark dialog box will appear. 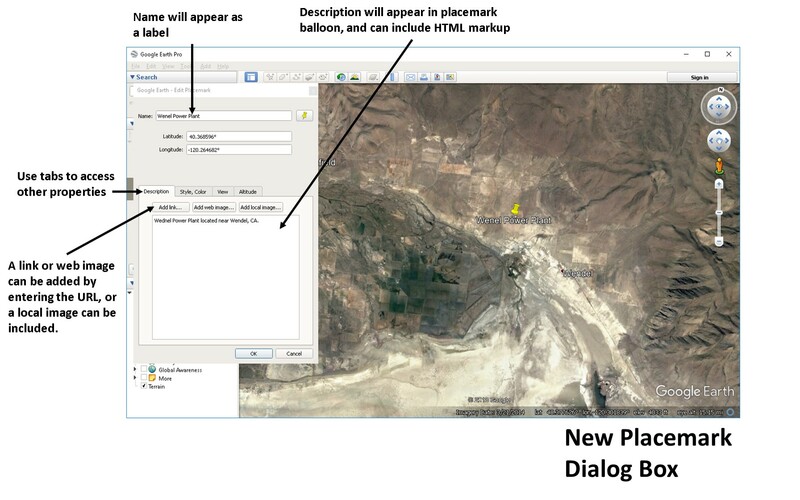 While the New Placemark dialog box is open, the information inside can be edited and the placemark can be dragged to adjust it to its proper position. The various tabs can be used to access the placemark's properties including its name, description, the icon that is used to represent the placemark in the 3D viewer, the color of the icon and the label, and the orientation and zoom level of the 3D viewer that results when the placemark is double-clicked in the Places pane. You can create your own custom icons for your placemarks. 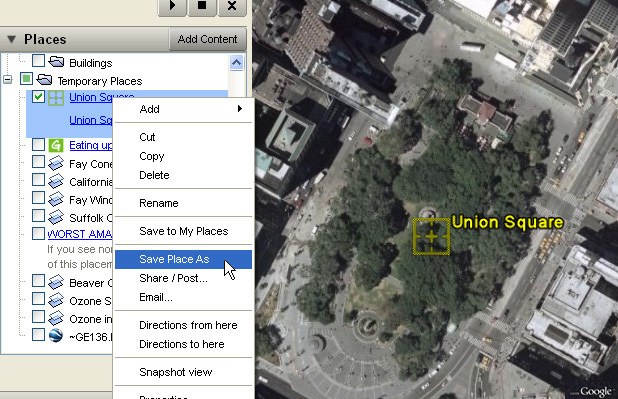 Placemarks and other items can be edited after they are created or opened in Google Earth. Right-click (ctrl-click on the Mac) the item in the Places pane or in the 3D Viewer to open its Edit dialog box. While a placemark's dialog box is open, the information inside can be edited and the placemark can be dragged. Placemarks can respond to mouse clicks by displaying information balloons that contain text, images, hyperlinks, and other structures that can be implemented in HTML. Information intended for display in the balloon should be entered into the Description text area. Images can be embedded directly into kmz files or can be stored on a server, such as Flickr, and referenced via http. There are advantages and disadvantages to each method of offering images. It is important that you save your data periodically in a proper manner, so that if a problem occurs, you have safe copies of it. To save data properly, you need to understand how the items in the menu bar and pop-up menus function concerning the process of saving data. To save an individual placemark, right-click its name (ctrl-click on the Mac) in the Places pane and choose Save Place As. Navigate to a folder where you would like to save the item as a file, give it the name you would like, and click the Save button. Your choices are to save it in KMZ or KML format. The default name for the file is based on the name of the item to be saved, and the default file type extension is kmz. In general, saving the file as a KMZ file is a good choice, because if the placemark contains embedded images that reside on a local storage device, copies of those images will be incorporated into the KMZ file, minimizing the likelihood that the file will become separated from essential content. It is also a good idea to make backup copies of your saved files. 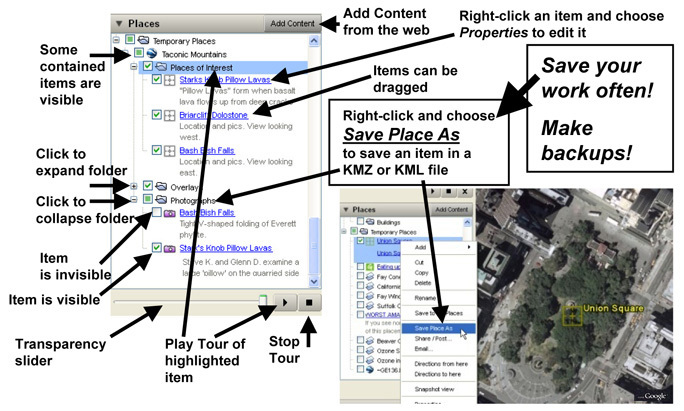 Save to My Places is a less secure option, since it moves the placemark to the My Places folder, and depends upon Google Earth to save it for a future session. In a public facility such as a computer laboratory, where machines are shared by multiple users, the machines are often configured to log the user off after a certain duration of inactivity. It is possible that the managers of the facility have arranged for the My Places folder to be purged of added content when the session terminates. It is a good idea to keep multiple copies of KMZ files and any other saved material that you value. Folders, documents, paths, polygons, and overlays, which are discussed below, can be saved in a similar manner to placemarks. The File menu in the Google Earth menu bar provides another means of saving information. To save a feature or container as a file, make sure it is highlighted in the Places or Search pane and choose File -> Save -> Save Place As in the menu bar. Navigate to a folder where you would like to save the item as a file, give it the name you would like, and click the Save button. This option is risky, since if you have the wrong item highlighted you may mistakenly overwrite a needed file with content that you did not intend to save. For additional details, see Google Earth User Guide: Using Places and Google Earth User Guide: Marking Places. The Add Path and Add Polygon buttons on the toolbar initiate the process of creating new paths or polygons, respectively. Once the corresponding dialog box opens, you can draw the path or polygon by either clicking or left-dragging the mouse. The tabs in the dialog box provide access to various properties. Creating a new path in Google Earth. Points along the path can be added, dragged, or deleted and the information can be changed while the New Path dialog box is open. The Edit Path dialog box can be opened to alter the path after it has been created. Creating a new polygon in Google Earth. 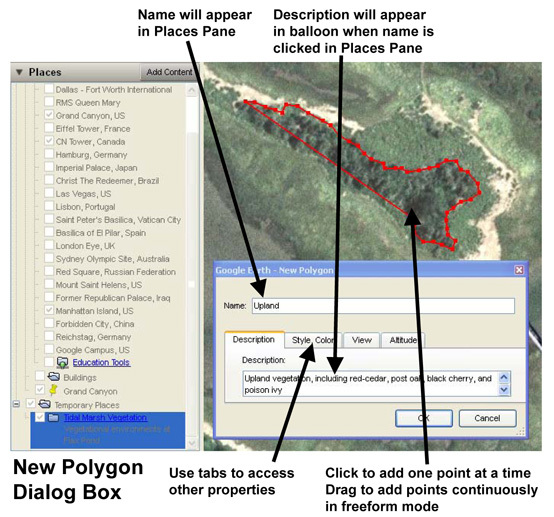 Points can be added, dragged, or deleted and the information can be changed while the New Polygon dialog box is open. While editing a polygon, it is a good idea to remove its fill so you can see the underlying imagery. To remove the fill, activate the Style, Color tab in the dialog box, and use the pulldown menu for Area to specify Outlined. The Edit Polygon box can be opened to alter the polygon after it has been created. Note that after you have selected a point in a polygon or path by dragging it or just clicking it, the next point you add will be topologically after that point. If you want to continue adding points, instead, after the most recent point you added, you will need to reselect that point first. As is true of other work that you do, it is important to save your paths and polygons either by saving them individually, or by saving the containers, namely folders or documents, in which they reside. 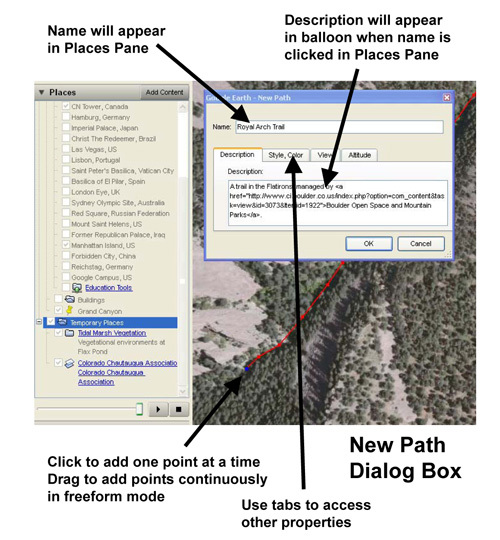 For additional details, see Google Earth User Guide: Drawing Paths and Polygons. Digital maps can be added to the Google Image 3D Viewer as image overlays. They need to be adjusted to conform geospatially to the underlying Google Earth imagery. To create a new image overlay, first navigate to the location where you would like to place the new imagery. Then click the Add Image Overlay button or right-click the container listed in the Places Pane in which you would like to put the new overlay. There are other means of initiating this process as well. In either case, the New Image Overlay dialog box will appear. Use the slider to control the transparency of the image so you can move, rotate, and stretch it, using the available green handles, to fit the underlying Google Earth imagery. Once you are satisfied with it, you may make it opaque again. The tabs allow you to control other properties of the overlay. One of the useful settings is the Draw Order which is available in the View tab. Since overlays cover the area where they are situated on the globe when they are visible, they inevitably obscure other overlays that they overlap if those overlays are drawn first. If you have a preference for the order in which overlays in a set are drawn, assign low Draw Order numbers to the ones that you would like to appear on top so that they are drawn last. The ones with the highest numbers are drawn first, and get covered up by ones with lower numbers if they occupy the same parts of the globe. Click OK when you are satisfied with the overlay's location and other properties. Remember to save your work in a file. While you are creating overlays, it is a good idea to have the Terrain layer deactivated. During the creation of overlays of map images that include national or state boundaries, it may be helpful to have the Borders and Labels layer active as a guide for adjusting the placement of the image. See Google Earth User Guide: Using Image Overlays and 3D Models. Google offers a huge amount of mappable data from its database through the Layers Pane. The growing set of layers include roads, volcanoes, 3D buildings, terrain, borders and labels, weather, photographs, earthquakes, news, YouTube video, and much more. The layers are arranged hierarchically, with some of the layers containing several levels of sub-layers. To expand a layer listed in Layers Pane, so that you can see a listing of its contents, click the + sign to its left. You can collapse it later by clicking the - that appears. As with items in the Search and Places Panes, you can control visibility of the layers with their checkboxes. The Terrain layer has a special status. While it is activated, the Earth's landscapes appear in 3D. This especially apparent when the 3D Viewer is tilted so that there is a horizontal component to the user's perspective. Vectors (placemarks, paths, and polygons) and overlays can be organized into containers such as folders and documents. Vector features can be assigned styles, which in the case of placemarks control color, opacity, size and the icon, and with paths and polygons, control color, opacity, and thickness of lines. Polygons can be filled or outlined. When saving your work, be sure to specify the container that contains your data as the item that will be saved. When the container is saved in a KMZ file, the contents of the container will be saved along with it. Right-clicking (ctrl-click on the Mac) the item in the Places Pane and choosing the Save Place As item in the contextual menu that appears is the best way to save your work because it minimizes the likelihood that you will be mistaken about what you have saved. 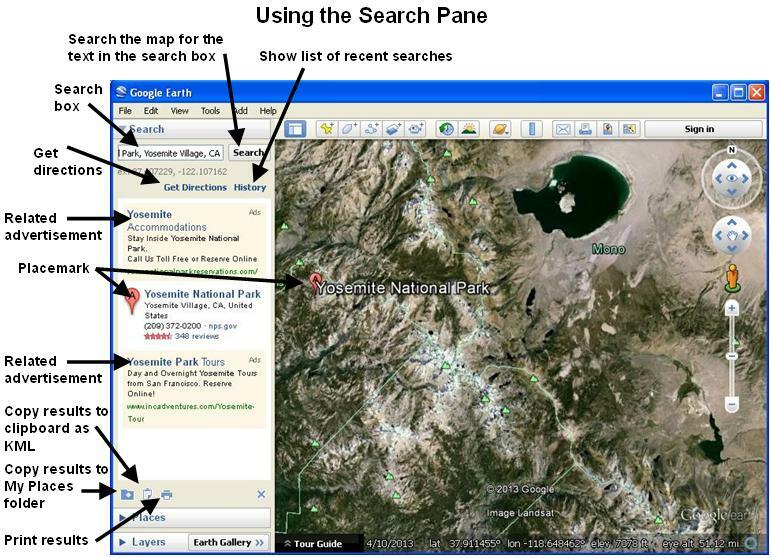 Some of the functions of Google Earth can be accomplished through the menu bar at the top of the interface. The Save Place As option in the File Menu has a similar function to the Save Place As option in the contextual menu that appears when you right-click an item in the Places or Search Pane. If an item is highlighted when you choose this option from the file menu, the dialog box will enable you to save that item. If nothing is highlighted you may be prompted to save the My Places folder along with its contents in the Places Pane. The hazard with using this option from the File menu is that if you are mistaken about what is highlighted, you may not be saving the work that you intended to keep. There is a danger that when you exit Google Earth, your work will be lost. The safe thing to do is to right-click and save the intended item through the contextual menu. 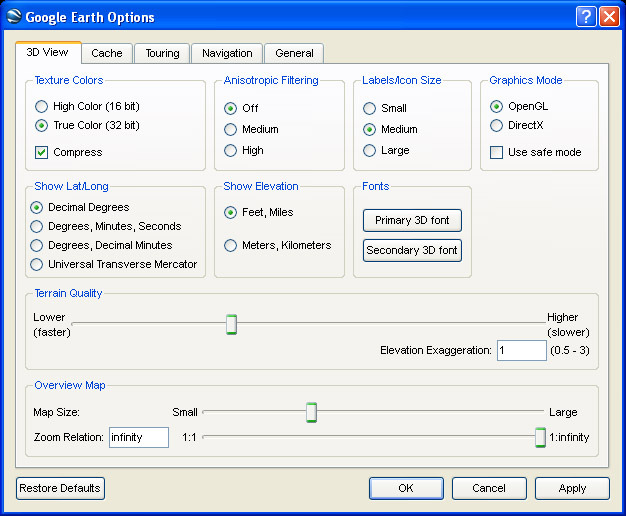 The Options item in the Tools menu opens a dialog box that enables you to control many settings for Google Earth. With the five tabs that are available, you can control the units that are used to display latitude and longitude, and elevation, the vertical exaggeration of the terrain layer, fonts, tour settings, and many other parameters. On the Macintosh, the Options item is in the Google Earth menu. 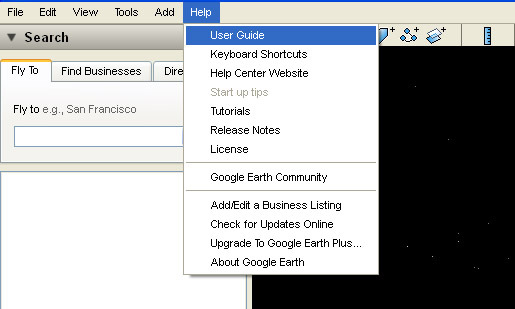 The User Guide item in the Help menu takes you to the Google Earth User Guide web site. The Google Earth Community item in that menu takes you to the Google Earth Community Forums. Diana Krupnik, UNAVCO USIP intern (GETSI Project). This was drafted by Diana and may be reused for any purpose as long as attribution is given, and any derivative works are shared under a similar license.